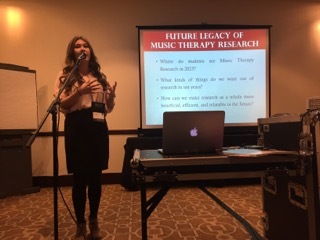 Majesca Wong presents “Music Therapy Research 2025: A Student’s Perspective” at the American Music Therapy Association’s National Conference in Kansas City, Missouri. A nervous freshman who just graduated from Loara High School in Anaheim, Majesca Wong attended her very first class at California State University, Northridge in fall 2014. At the end of the class, she felt overwhelmed by the extensive coursework outlined in the requirements for her major, music therapy. Wong recently discovered her interest in music therapy in 2014 and wondered if she chose the right path. In addition to the rigorous curriculum, CSUN’s music therapy students are required to sing, play piano and strum a guitar. Just one year later, the passionate musician has become a role model in her field, recognized by her professors for her outstanding work. Wong is serving as president of the Student Music Therapy Club, she works at Miller Children’s Hospital in Long Beach and volunteers at Parthenia Elementary School in North Hills. She also has carved out time to play the French horn in CSUN’s Wind Ensemble. A lifelong music lover, Wong has been playing the French horn since high school. She didn’t want to pursue performance as a career, she said, leaning toward special education because of her love for children. It was her band director in high school who recognized her musical talent and introduced her to music therapy as a way to combine music with working with disabled children. To fulfill her first field work requirement for her major, Wong worked with a choir for people with developmental disabilities. She said the experience boosted her motivation to become a music therapist and eliminated her doubts. In July, Wong participated in the American Music Therapy Association’s national conference, “Music Therapy Research 2025: A Student’s Perspective,” in Kansas City, Missouri. Barbara Else, one of the conference organizers, previously presented a guest lecture on the psychology of music in Wong’s class at CSUN. Wong said she was instantly inspired by Else’s work. Wong presented the poster in front of more than 40 professional music therapists, researchers, students and interns at the conference. Music professor and CSUN Music Therapy Wellness Clinic director Ronald Borczon said Wong has been very engaged in connecting the classroom with real-life professionals. “[Wong] has shown wonderful leadership skills, working closely with myself in bringing music therapists to CSUN for workshops,” he said. Wong is slated to graduate from the two-year music therapy program in spring 2016. After graduation, she plans to work in a six-month music therapy internship, helping people in the process of discovering and reaching their full potential through music therapy. “Her desire to help people with their various issues in life is a gift to all those she serves,” Borczon said.